Flash Reviews Are Short & Fast, But Stuffed With Nerdy Goodness. How do you shine a light through an opaque system? When the media, politicians, lawyers, and authorities look the other way it poses quite a challenge for truth seekers. Before social media took over and dictated what CNN reports, journalists probed deep to investigate and uncover the truth. SPOTLIGHT is the name given to a devoted team of Boston Globe journalists, who specialize in shining the light into the darkness. Their latest assignment illuminates the horror of child abuse in the Catholic Church. Michael Keaton leads this elite team of writers. His performance is quite reserved compared to his usual live-wire manic roles. Let’s say it’s more subtle than BIRDMAN. Keaton’s character traverses an emotional arc with a bitter sweet finale. While Keaton is impressive, Mark Ruffalo is even better. Every performance is top-notch here, including co-stars like Stanley Tucci; however, Ruffalo disappears the most into his role. His physicality draws you in, like his fast talking through a clenched mouth. Ruffalo is also the most determined and outwardly emotional. Perhaps, he reacts as the audience expects, so he is easy to root for and attach ourselves to as one of the heroes. 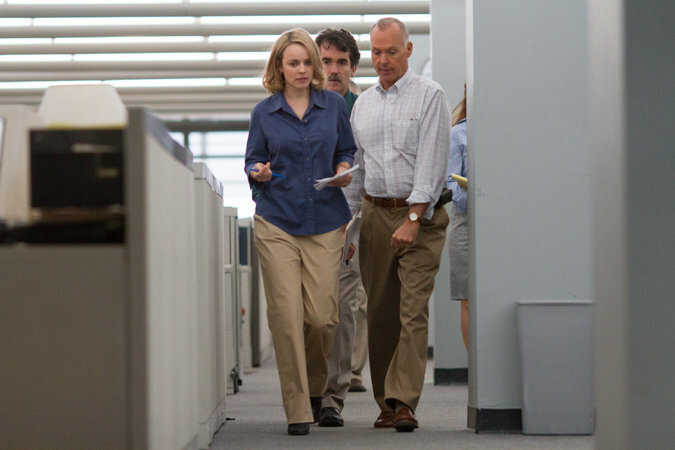 Ruffalo’s hard-nosed journalist is contrasted with Rachel McAdams. Her journalist relates to several victims as she conducts intimate interviews about their tragic past. She never once over-sympathizes or gets too emotional. She knows they will feel better by reporting the truth and getting their story out there. Like Keaton, McAdams is also subtle and restrained. When she lands an important interview with a priest, she doesn’t appear too frazzled. Rather, she invites us inside her character. Knowing the importance of this moment, and relating to these journalists, makes the audience even more anxious. 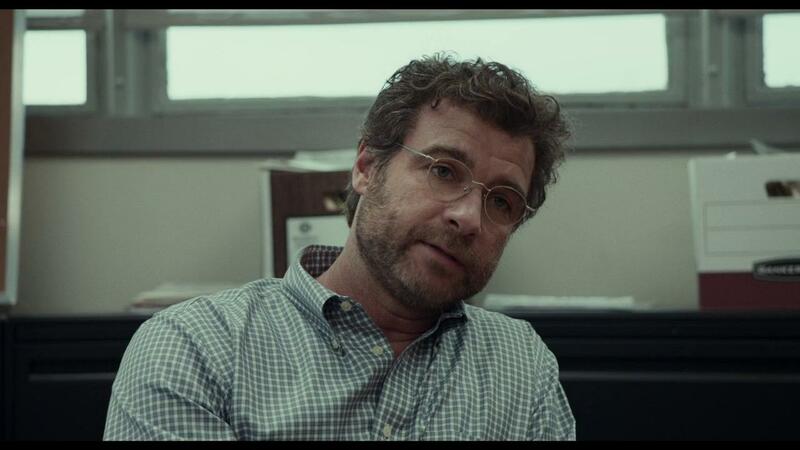 The surprise performance here was from the quiet yet imposing, Liev Schreiber. He points the Spotlight team in the right directions, determined to reveal the sexual abuse Church scandal. While he’s making some brash decisions, like “suing” the Church, he is so calm he might as well be taking a nap. Despite this subdued performance, Schreiber’s dominance is ever present, like a gentle giant. 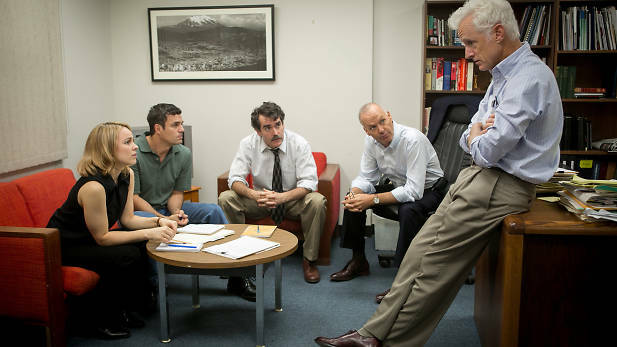 Part of what makes SPOTLIGHT so enthralling is the brilliant storytelling. Despite the dense material and controversial nature, the story moves along at a tight pace. With a lot of clever dialogue and a focus on the truth, this movie feels like a 2-part episode of the excellent (and ignored) NEWSROOM (written by Aaron Sorkin). While we hear from victims, these sequences are never embellished with a manipulative score or a reliance on emotional close-ups. When these interviews happen, they are presented rather matter-of-factly, like a documentary. 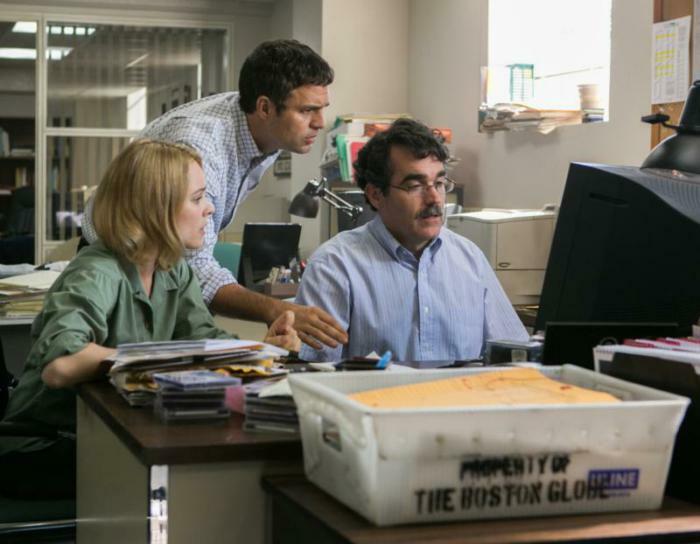 SPOTLIGHT reminds us of the importance of investigative journalism. Many reporters today just repeat information. They don’t uncover their own stories with research like the Boston Globe team featured in this film. Journalists like this need to be championed because they are invaluable to our society. This movie does an amazing job emphasizing their importance. There’s a lot of award buzz surrounding this complicated story. The hype is deserved, especially for screenplay and direction. This is one of the best dramas of the year. Do not let this one Slip/through the cracks. Posted in movie review, moviesTagged abuse, award, best, boston, catholic, children, controversy, drama, globe, journalism, mark ruffalo, michael keaton, molestation, movie, movie review, newspaper, oscars, priests, rachel mcadams, review, scandal, spotlight, true storyBookmark the permalink. Good review, but one year on, and I still cannot get my head around the actor/actress nominations in this film. I love Ruffalo as an actor, but what the hell did he do in this film to get nominated? A very mediocre acting on his part here, in my opinion. He did even better in Campion’s In the Cut alongside Meg Ryan – which was largely ignored. Thanks for commenting. I think Ruffalo got the nom because he kind of represented the audience. He took a stand and said what we were thinking, whereas McAdams was more restrained and subtle. I think voters remembered Ruffalo’s speech and felt motivated. Maybe the Oscars should have an ensemble cast award to make more sense of situations like this? Dammit, yet another one to put on my list before Oscar day. Good review! Thanks buddy. And deffo worth adding to The List. I’m off to see this movie today. Will be sure to review it once I’ve seen it. Right on… I noticed you reviewed it. I’ll be reading it soon, buddy. I hope you liked it. Thanks man, the film made a real impact on me. Great review, it’s just been released where I am and I plan to see it in the next week. It’s good to hear that this film deals with an important story but doesn’t sensationalise it at all. I like the sound of it as documentary style filmmaking, sounds much more realistic than some based on a true story movies. The movie never over embellishes, or takes the easy way out to demonstrate its story. It would have been rather easy to confront a priest or have a scene with a yelling match or some abuse on screen. This story is about the journalists and how they seek the truth… and how they are the underdogs against a corrupt system that extends beyond the church and its own corruption. Thanks for making me think more about it. I can’t wait to see it because the approach to the film seems very natural. I will be sure to write a review of it when I see it. Its pretty good but not one of my favorite films of the year. I think Ruffalo was excellent in this but wasnt all that impressed by any of the other performances. Glad you liked it though. Will be reviewing this soon. Ironically, Spotlight didn’t have those big scenes that normally “spotlight” an actor’s talent. It was more dialed back. Looking forward to your review. You’ll probably respect journalists even more and champion their efforts. You will have some questions too, which are worth the introspection. Nice one pal, need to catch this when it finally gets a UK release, unless I missed it already? This is an independent film (despite what the cast may make it seem) so I’m not sure on UK release. Open Road films is behind the picture if that helps you out. I think after Awards shows it will get more hype and more screens worldwide (and domestically too). Very compelling story indeed. Thanks for commenting. This storytelling is a real strong point. Old fashioned grab your attention good (no explosions necessary hehehe).